Seoul is hip, technologically advanced, and very densely populated (although thankfully there is less mobbing than in China). There are TVs in the subways, free WiFi spots practically everywhere, and a smartphone in the hand of basically every person on the street. And there is lots of rain – at least in July. Unfortunately for me, a person who really hates rain despite growing up in the rain capital of America, this July is apparently the rainiest July ever (at least during the lives of some locals who were commiserating about the rain with me). This is the sort of thing that I would normally let ruin my entire visit to a city, but reminding myself that this is just part of the education, I accepted it. And in fact, far from ruining my trip to Seoul, the rain actually brought about one of the best parts of it. My hostel was in the Hapjeong neighborhood, a young, trendy area near Hongik University. Literally every single building in Hapjeong is either a coffee shop, cafe, restaurant, bar, club, or boutique, with a few apartments sprinkled in. At any time of day or night, there are a ton of young people milling about, strolling the streets, or spilling out of bars. A few drops of rain were falling while I wandered around the neighborhood looking for my hostel (which I had pre-booked after learning from my Shanghai experience), and luckily it was only after I was finally safely inside the hostel that the drops turned into a downpour. The ground was wet but the rain had stopped when I woke up the next morning. 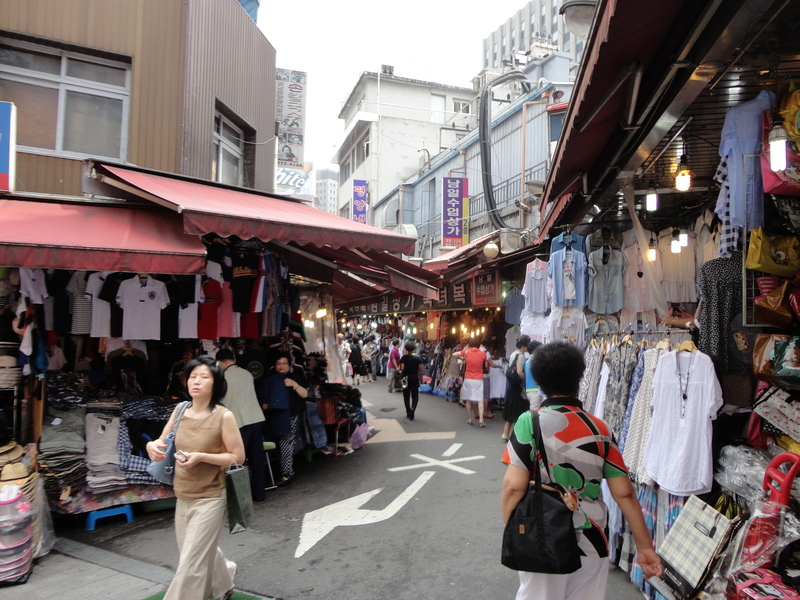 I took advantage of the dry skies and explored the Namdaemun market, a huge street market where locals sell everything from bedding to lingerie to toys to jeans to belts to hats to hair dye to fake purses to all sorts of different kinds of food. An older Korean woman enticed me into her restaurant for lunch, saying she had an English menu. The “English menu” was a table of all of the restaurant’s dishes in plastic form, which I thought was actually pretty clever. The real version of what I pointed to – Naengmyeon, a cold noodle dish with cucumbers, lettuce, and hard boiled egg – was even more delicious looking (and tasting) than its plastic counterpart. Full of Naengmyeon and tea, after lunch I headed to the glamorous Shinsegae department store. It is by far the most luxurious department store I have ever been in. There were beautiful furnishings, a grand staircase, and ice cold air conditioning that felt fabulous compared to the humid post-rain hotness outside. Only the most exclusive and expensive designers were being sold: Chanel, Dolce and Gabbana, Hermes, Louis Vuitton, Armani, Louboutin, among others. It was heaven. Knowing that every single item in the store was waaaay out of my budget, I meandered through the store thoroughly enjoying perusing and not buying while avoiding eye contact with the disdainful looking sales girls. After a quick rest in the department store’s 12th floor rooftop garden (yes, it even had a rooftop garden), I headed in the direction of a large grassy hill with a funny looking tower on the top. My curiosity demanded that I find out what it was. At the base of the hill was an an elevator following a diagonal track up the side of the bottom of the hill, which led to a cable car up to the top of the hill. I decided to walk down the other side of the hill rather than take the cable car back where I came from. Partway down, an outdoor gym appeared on the side of the path, with bench presses, pull up bars, and other workout equipment. I thought this was very random and odd, but there were several people working out – young and old, men and women – so I decided to do a quick workout for fun. Later, I saw many of these outdoor gyms around the city. I guess Seoulians like to stay in shape! Upon my arrival back in Hapjeong, I couldn’t resist stopping in one of the coffee shops in the neighborhood. It looked so cozy and inviting inside, and I justified the “westernized” experience by telling myself there were a bunch of Koreans inside, so it was actually an authentic Korean activity. For my three days in Seoul, this ended up being my favorite thing to do – finding a random coffee shop in my ‘hood and chillin’ there for awhile. Starting the day with a coffee and relaxing for a bit before getting started. Ending the day with a sandwich or tea and reflecting on what I did that day. 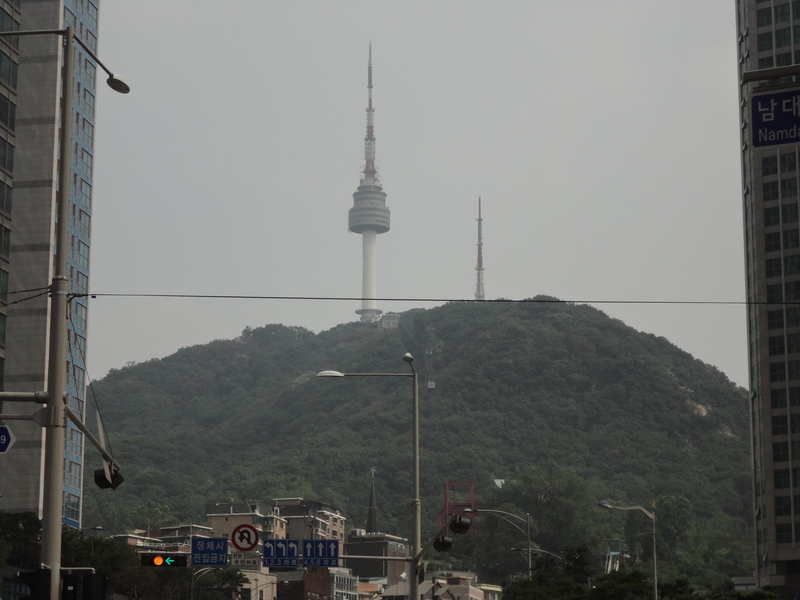 It was so fun, and I think it will be one of my best memories of Seoul. 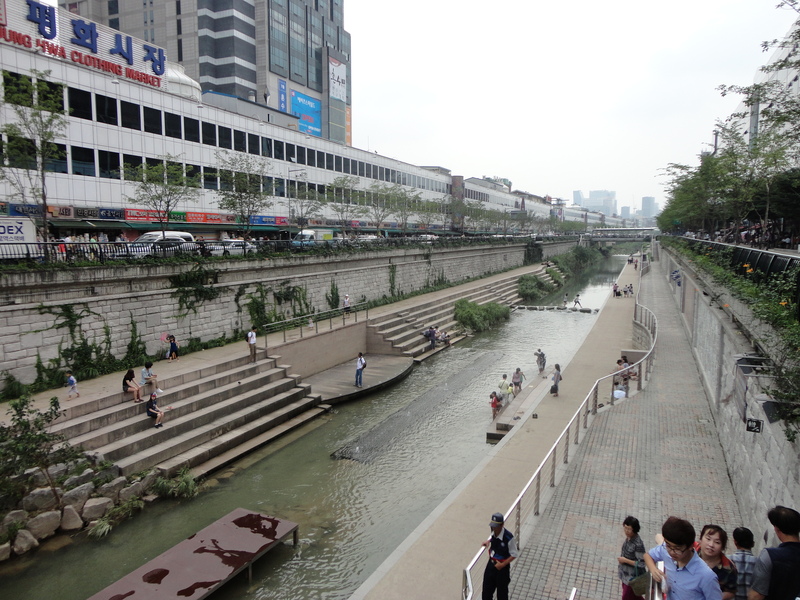 The next day was still moderately dry, so I took a walk around Cheonggyecheon, a newly restored stream in the middle of the city that is surrounded by a pedestrian walkway. Then I spent a few hours at Gyeongbokgung Palace, which is in the process of being renovated to its pre-WWII glory before it was destroyed by the Japanese during the war. It was cool to see the palace, but it felt a bit artificial because of the new construction wood and paint smell. While I do think it’s important to keep this sort of history alive, it’s just not the same when it’s a brand new version of what it used to be, even if it’s an exact replica. I ended the day of sightseeing in Bukchon Village – a maze of streets and alleys set on a hill, lined with restaurants, boutiques, and hanok (traditional Korean wooden houses) – then topped the day off with an hour or so at a coffee shop in Hapjeong. The rain made another appearance on my last day in Seoul, and it came back with a vengeance to make up for the last two fairly dry days. A day of exploring Itaewan, the ex-pat neighborhood, was out of the question. Upon the suggestion of one of my hostel roommates, I decided to spend the day at the Korean War Museum. At the very least, I thought, I would stay dry for a few hours. Museums have never been my favorite thing to do in a city. I’ve always been of the opinion that you can learn much more about a place by being out and about, walking around and observing things and people. Of course, if it’s a major attraction, like the Louvre in Paris, I will do a stop-by. But for the most part, a museum trip isn’t at the top of my list of things to do in a city. The Korean War Museum completely blasted this theory of mine into bits. I was totally and utterly enthralled with the history of wars in Korea. Most of the museum was focused on the division of Korea after WWII and the subsequent attack on South Korea by North Korea, starting the Korean War. I learned so much about Korean history and how the lack of unification is still effecting the political climate and South Korean life today. I was shocked when a museum worker told me “closed, need to go.” I had been so engrossed in my Korean historical lesson that I didn’t notice the entire day go by. I spent my last few free hours in Seoul on the covered porch of a coffee shop in Hapjeong, listening to the rain pelt the roof and thinking about the devastation of war and how lucky I am that up to this point in my life, I haven’t truly been immediately affected by it. Early tomorrow morning I’m taking the train south to Busan where I’m hoping to trade the crazy rain for a sunny beach!